I am officially on vacation today and tomorrow! With Monday being a holiday, it will be nice to spend 5 days away from job #1. (I still have to go to job #2, but since that involves working with plants it's a lot easier to go to most days.) Plans for today included getting up early to putter about in the garden, going to the Cleveland Botanical Garden Flower Show, and meeting another garden blogger, Kylee from Our Little Acre, while I was at the CBG. 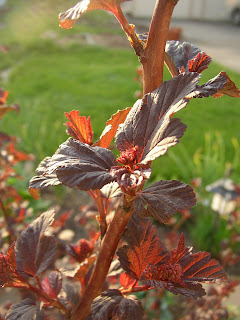 Two pictures of my 'Diabolo' (aka 'Diablo,' aka 'Mondo') ninebark, physocarpus opulifolius. I love where this shrub is placed in my garden. Every morning, I open the curtains in the dining room so that my houseplants can enjoy the morning light. 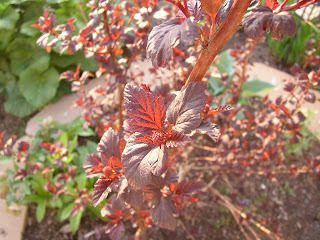 When the sun is shining, my ninebark greet me with a jewel-like glow. 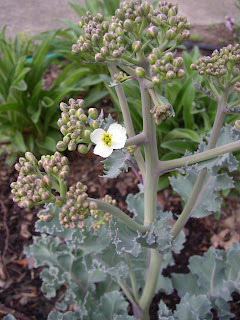 First bloom EVER on my sea kale! I would grow crambe maritima just for its foliage alone, but these little flowers are cute, too. 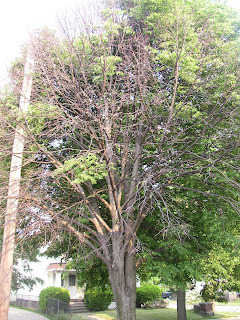 There are more buds on this one, but its two neighbors show no signs of flower stalks yet. The two non-flowering ones are a bit more shaded, and that's probably why. YIKES! I usually feel sorry for these treelawn-planted trees anyway. 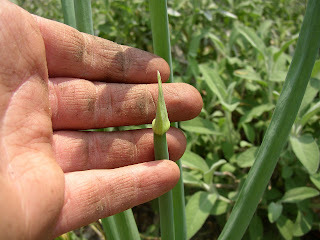 Their roots are all hemmed in, they're oversized for the area where they are planted, and so forth. But half of this one didn't even leaf out this year... wonder if I should start planting more sun-lovers in my front garden? Many days, I am amazed at what people throw out with the garbage. I've snagged metal trellises, a grandfather clock, an old sewing table with great carved wood and a cast iron base, and on and on. The above picture shows my latest acquisition, a large black milk can. Normally I'm not a black-milk-can-in-the-garden kind of girl, but it looks appropriate in the backyard of my 1919-built home. A larger view of the Japanese rock garden area. The peony bush that currently hides most of the area behind the right hand side needs to be moved--I can't believe it's already waist-high! The monster on the left at the end of the rock garden is reason #1,254 that I need to get that fence in. The blackberry should really be trained against a sturdy fence rather than that puny trellis. That's all for now... more pictures to come this weekend as I get more things weeded and presentable! During my first few weeks of college at the University of Dayton, I befriended a smart, feisty girl from Youngstown. Jessica and I had a lot in common: A love of good music, blue-collar roots and a strong sense of ethics, an appreciation for literature and cooking, enthusiasm for sports, and so on. 13 years and many lifetime landmarks later, I am proud that I can count Jess among my best friends. She probably knows me better than anyone else on this earth, and trust me when I say that it reflects very well on me that she still grants me the honor of her friendship. This weekend, Jessica made the drive north from Cincinnati to spend time with her mom in Youngstown and run the Cleveland Marathon. On Saturday, while she and her mom perused a plant sale at Mill Creek Park, Jess mentioned that she and I were getting together later that night. Sandra, a fellow avid gardener, immediately suggested that they pick out a plant for me. When Jessica asked how they would know what to get, Sandra replied that she's visited this blog and could figure out from that what I would like. She was absolutely right. 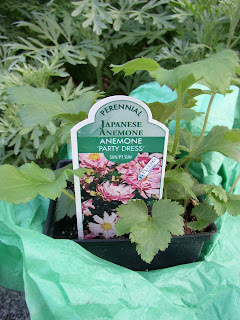 Check out the picture to see my newest garden addition: 'Party Dress,' a gorgeous, double-flowered Japanese anemone. WOW! I didn't even know this plant existed before I received this wrapped pot on Saturday but now that we've been introduced I'm smitten. It's definitely going in a place of honor, in front of the bed where I have a couple of its single-flowering cousins. I have been told that it is bad luck to thank someone for a gift plant--many of my relatives swear that the plant won't grow if you say thanks. So I'll have to figure out another way to let Sandra know how much I appreciate my new 'Party Dress'! Sandra, if you're reading this... I hope you don't mind the my informality in using your first name. I just try to keep last names off of my blog when posting about friends. While walking around taking pictures for Garden Bloggers' Bloom Day, I was struck by how nicely the area around the Japanese rock garden is filling out. 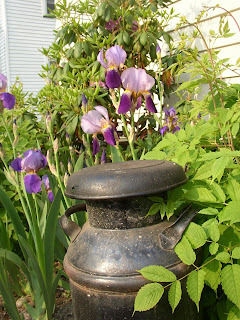 Taking a cue from Kasmira, I decided to write a quick post about this area, my current favorite spot in the garden. 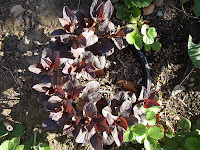 The red sedums--I have both 'Fuldaglut' and 'Voodoo' but can never remember which one lives in each area of the garden--are filling in nicely all the way around. 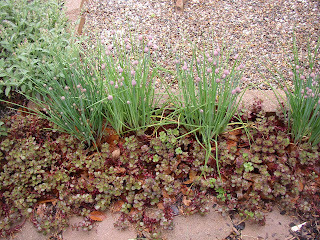 Their rosy color mitigates the unnatural peachy brick tones of the recycled landscape block that borders both the rock garden and the sidewalk beside it. 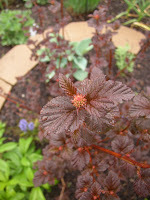 They also contrast nicely with the cool grey-green of the culinary sage, the bright green of the chives, and even the dark green of the nearby blackberry. Two years ago, my boyfriend decided to surprise me while I was stuck working overtime. 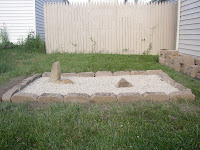 I came home one day to find a small Japanese-inspired rock garden plopped down in the middle of my backyard! Japanese garden purists would scoff at our feeble attempt--and since he rarely reads my blog I will admit here that he did not really live up to my construction standards. 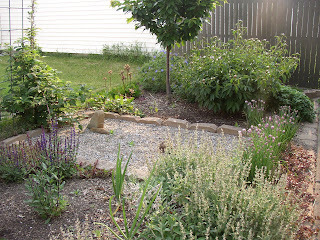 But I love that he took the initiative to add something to the garden that he knew I would enjoy, reused stones and landscape block that were part of my spring 2005 retaining wall demolition, etc. More than anything, I am just happy that he's taking an interest in the garden and prefers plantings to grass! Speaking of, the grass disappeared from that area shortly thereafter and the ugly beige fence was painted a muted dark grey. The doomed 'Bing' cherry tree, an old peony that I inherited with the house, a blueberry, a couple of espaliered apples, a grapevine with a trellis, and various other things have come to live in this area. 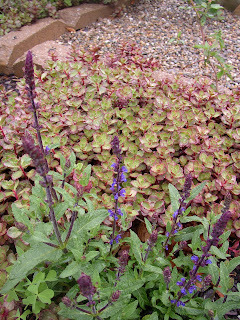 I love how the 'Caradonna' salvias look against the bed of red sedums... the dusky purple leaves of 'Ichiban' eggplant do similarly good things for me on the far side of the rock garden. I will definitely be keeping an eye on this area as spring progresses. I plan to build a trellis for the grapevine soon, and the wood is already stained a dark red color. The previously mentioned peony has blowsy double flowers that are the brightest shade of magenta you can imagine--and it's already waist high this year so it will need lots of space when it blooms. 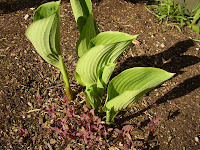 And a little further back, the 'Sum and Substance' style hosta that I got a start of at work is starting to unfold its leaves. It may turn out spectacularly well... it may turn out spectacularly awful... but either way, it sure will be interesting to watch! 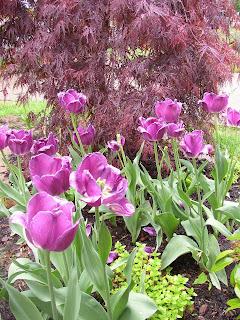 For various reasons, ranging from rain--finally!--to work schedules to the discovery that my old rechargeable batteries* needed to be replaced, I'm late in posting my Garden Bloggers' Bloom Day lists for May. Tonight I had batteries, time, and a short lull in the rain. The cool light of a rainy day isn't my favorite for photography, as the warm light at the beginning or end of a day seems more friendly to an amateur like me. I struggled to get good pictures of some of the more muted elements in the garden... at least 4 attempts at capturing the luscious darkness of the nodding geranium flowers failed. Even the good pictures, like the one of the Japanese maple and fading purple tulips, don't really convey the zing that the golden oregano adds to the whole scene. 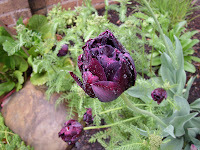 My disappointment at the poor photos was definitely tempered by the discovery that many things were in bloom or in bud in the garden, though. 6 - salvia officinalis sp. Most of these things don't usually bloom at the same time, if my memory serves me. I swear that the bleeding heart and the ajuga were long spent before I saw any signs of flowers on my salvias last year. The cold in early April must have set a few things back and effectively crammed all of our early-, mid- and late-spring bloomers into a few short weeks. Whatever the reason, I'll take it... and enjoy. *Note: the new rechargeable AA lithiums can apparently take up to 2 days for the first charge, so plan accordingly if you buy some. Hopefully that's a sign of how long the use time is, too! I have been rather emboldened by other gardeners' recent reactions to my Lazy Bed Construction confession. So much so that I will confess to at least one other odd behavior: When I'm out shopping at garden centers, I enjoy looking at other people's shopping carts and trying to figure out what kind of gardeners they are. I try to look at the cart first, so I can guess by the plants whether the person pushing it is a first-time homebuyer, formal herb gardener, die-hard veggie grower, someone who has to have the latest variety of everything, or a shade gardener with a huge hosta addiction. Of course, I play the game with my own cart, too. What does my shopping cart say about me? I think that this one definitely gives away a few things: 1) I'm a fairly eclectic gardener, meaning that I don't have just one set garden style. 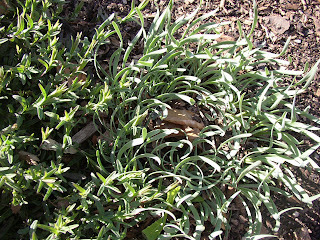 2) I'm not a typical plant snob, as evidenced by the purchase of groundcover sedums and "lowly" herbs like thyme, rosemary, and lemon verbena. 3) I am a huge foliage freak. 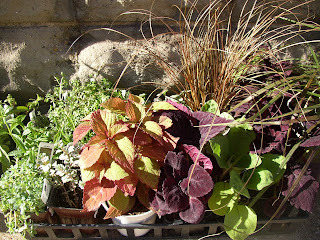 See the 'Royal Glissade' and 'Palisandra' coleus, carex flagellifera, 'Gage's Shadow' perilla, 'Silver Falls' dichondra, pennisetum rubrum, sedum cauticola, etc. I may be the only person who plays my little game, but I bet that almost all of us have looked down at our carts as we're waiting in line at the garden center and wondered: "What does this little collection of plants say about me?"